Whisk oil, lemon juice, garlic, honey, cumin, paprika, cinnamon and rosewater, if desired, in a bowl. Season with salt and pepper. 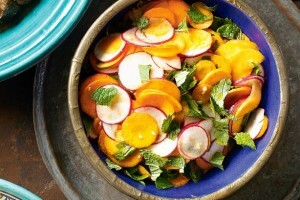 Combine the carrot and radish in a large bowl. Add dressing and mint to the salad. Toss to combine. Serve.